Hyperconvergence infrastructure is a software-centric architecture that tightly integrates compute, storage, networking and virtualization resources on a single hardware platform – all supported by a single vendor. Hyperconverged Infrastructure or HCI is fast emerging as a key enabler for businesses seeking to replace legacy infrastructures or update current systems and processes. As well as it being impractical for today’s enterprises to move their entire infrastructure to the cloud; legacy infrastructures are hindering, if not preventing this from happening. HCI is a key step towards enabling enterprises to achieve this goal. The white paper “Understanding Hyperconverged Infrastructures” is an essential read for organisations who want to take a closer look at HCI and the benefits it can bring to their business. Download it here. More and more leading organisations are going beyond hyperconvergence and turning to an enterprise cloud strategy to bring the agility, simplicity, and pay-as-you-grow economics of public clouds to their datacentres. 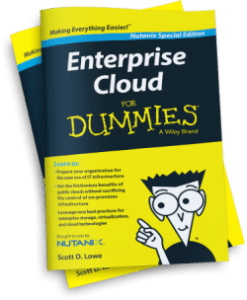 Connect to Trilogy’s HCI hub to download Enterprise Cloud for Dummies to help you understand what it is and how to architect a cloud infrastructure to propel your organisation into the future.